Millions of Americans suffer from chronic non-healing wounds associated with diabetes, poor circulation, pressure or other conditions. MVH's Center for Wound Management is an outpatient treatment program that takes a holistic approach to treating the entire patient, not just the wound. Our skilled team of physicians and a certified wound care nurse work with you to create an individualized treatment plan, teach you how to care for your wound and how to reduce your risk of future occurrences. The Center is open Monday through Friday, 8 a.m. to 4 p.m. For more information, call 724-258-1912. Hyperbaric Oxygen Therapy (HBOT) is a gently pressurized treatment used to speed healing through the intake of pure oxygen. The air we breathe contains 21 percent oxygen. This percentage can be increased to 100 percent if inhaled by way of a mask or hood. The body's oxygen supply can be increased further by two or three times when resting in a hyperbaric chamber where 100 percent pure oxygen is lightly pressurized. When administered through HBOT, oxygen is absorbed into the bloodstream and body tissues at a far greater rate. Hyperbaric Oxygen Therapy can be referred by your family doctor, or you can simply refer yourself to our Center. After the referral, one of our qualified physicians will assess your condition to determine if HBOT treatment is your best option. If it is determined that HBOT is right for you, the physician will order a series of treatments for your individual plan of care. In order for the treatments to have the best outcome, all patients are encouraged to complete the entire series. 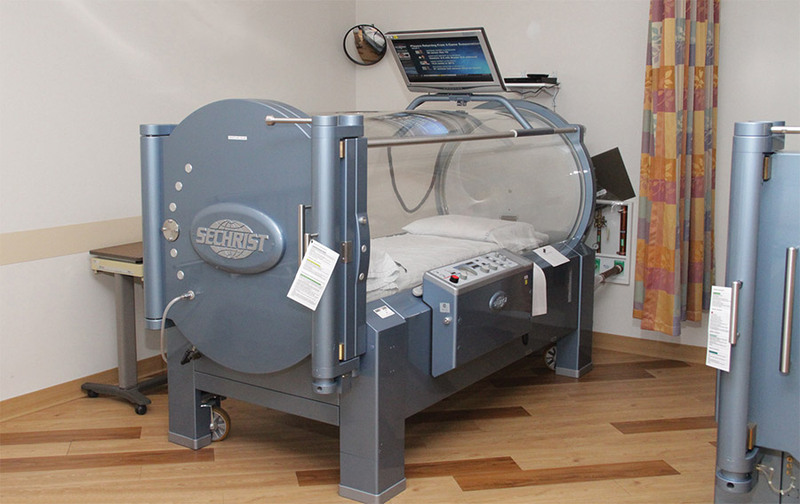 In the HBOT chamber, the air pressure is increased two times higher than normal. In this pressurized environment, lungs are able to take in more oxygen than if you were breathing pure oxygen at normal pressure levels. The oxygen absorbed into your system is then transported throughout your body to help fight bacteria growth and stimulate growth factors - substances within the body which promote healing. What Conditions Are Treated With Hyperbaric Oxygen Therapy? Where is the Hyperbaric Oxygen Therapy Department? Monongahela Valley Hospital's Hyperbaric Oxygen Therapy Department is conveniently located on the first floor of the Charles L. and Rose Sweeney Melenyzer Pavilion and Regional Cancer Center. Why Would I Need Hyperbaric Oxygen Therapy? There are many factors that impact the healing of wounds - diabetes, weight gain, heart disease, poor circulation and medications. These are just a few of the many existing conditions that can slow down or stop your body's ability to heal its wounds. Your body's tissues need an adequate supply of oxygen to function. When tissue is injured, it requires greater amounts of oxygen to survive. Hyperbaric oxygen therapy increases the amount of oxygen the blood can carry to improve a compromised patient's ability to heal. The Center for Wound Management and the Hyperbaric Oxygen Therapy Department at Monongahela Valley Hospital provide state-of-the-art treatments for all wounds - often the result of an underlying medical condition such as diabetes, neuropathy, arthritis, peripheral arterial insufficiency, autoimmune disease and factors associated with immobility. Our knowledgeable staff offers an interdisciplinary approach to treating wounds. Our team is composed of board-certified specialists in orthopedic and vascular surgery, enterostomal therapy, podiatry, family medicine, infectious diseases and hyperbaric oxygen therapy. You can be certain that you will receive high-quality care from all members of our nursing staff, certified wound specialists who have completed advanced studies. If your treatment requires, our team can also provide referrals for orthotics, dietary guidelines, physical therapy, pain control, home health care and orthopedic foot and ankle care. Our facility is committed to coordinating outpatient wound management procedures and activities required for optimal patient care. Treatments typically take about 2 hours and are ordered for 5 days a week. Appointments are available by calling 724-258-1934, Monday through Friday between 8 a.m. and 4 p.m.